Jamie Oliver's favourite dinner lady Nora Sands is quitting her job after struggling to change school meals "without support", a newspaper claims. Nora, who starred with the TV chef in Jamie's School Dinners, is said to be frustrated at a lack of government support for the healthy meals campaign. Jamie told the Daily Mirror it was a great shame Nora was leaving her job at Kidbrooke School in south-east London. Greenwich council said Nora was quitting for personal reasons. TV chef Jamie Oliver taught Nora how to cook healthier meals for the children at her school in the first series of the Channel 4 show. He said she had made incredible changes at her school. But when he returned to the school for the second series, having persuaded the government to pledge £280m investment in healthier meals, he found Kidbrooke School had gone into the red and that many children were bringing junk food in from home. He told the Daily Mirror: "I know that after a short break she is hoping to find a way to help and support all the other fantastic dinner ladies up and down the country who are working hard, often with very little back-up, to make sure the kids get a decent meal." Greenwich Council Leader Chris Roberts said there was no truth in suggestions that Nora was leaving due to concerns over budget issues. "She has made clear to us that her reasons are personal and health-related. "The additional cash allocated by the government for school meals has been invested in our meals service. In addition, Greenwich Council has invested £450,000 (2006/7) in the meals served to children. "The council is very grateful for all that Nora and all our school meals staff have done to create healthy and nutritious food for the children at Kidbrooke school over many years." He added that she had led the way in transforming the quality of food served to thousands of schools. Education Secretary Alan Johnson said Nora had made a "massive contribution" and hoped she would continue to play a role in the future. He said improving the health of all children was not a quick or easy job. "We are investing almost £500m in school meals to undo decades of neglect, and billions to update all our school buildings, including new, modern kitchens. "We're setting up a national network of training kitchens to make sure that the Noras of the future are fully trained and highly valued members of the school workforce. "I know that this is already making a huge difference to our children's diets. 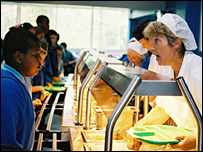 "But turning around attitudes to school dinners that are ingrained in our national psyche is a major long-term challenge involving government, schools and parents."